In this article, I will give a recap of a historical game Gonzaga played against Arizona in the round of the Thirsty in 2003. Following that, I will give a preview of the upcoming Gonzaga vs. Arizona game. I am a Gonzaga fan. I graduated in 1999 as the Zags were making their first runs into the NCAA tournament under head coach Dan Monson. The Cinderella story was expected to end when Monson was taken away from Gonzaga and moved on to coach for Minnesota, and assistant coach Mark Few took over. It turned out that was just the beginning. As of today, Gonzaga, a school of less than five thousand students, has made 16 consecutive appearances in the NCAA tournament, and Mark Few is now one of the winningest coaches in NCAA history. Sportsreference.com lists him currently as having the fifth highest winning percentage all time, and first among active coaches. Perhaps most surprising is the fact that Few has turned down offers from the likes of Indiana, Arizona, and Oregon to stay at little old Gonzaga. I think it is safe to say that without Few there would be no Gonzaga, at least as far as basketball is concerned. For a comperable underdog story in recent years, one would have to look at Butler. For a basketball school as indebted to its coach, one would have to look at Duke. As the round of the Thirsty Thirty-Two gets underway, I am reminded of one of the best games I have ever had the priviledge to watch: the 2003 matchup between the top seeded Arizona against the nine seeded Zags in the round of 32. At the time, Zona was being coached by the legendary Lute Olson, and his team was led by Jason Gardner, Channing Frye, and Luke Walton. Few’s Zags were led by guard Blake Stepp and big man Ronny Turiaf. With four minutes left in the second half, Arizona had a five point lead behind two made freethrows by Walton. Gonzaga was in foul trouble with two of its big men, Richard Fox and Ronny Turiaf at four fouls. Few wanted to take Turiaf out after getting his fourth, but Turiaf waved him off. On the following posession, Stepp drove in the lane and made a difficult shot over several Arizona players to bring the Zags within three. After a missed layup by Frye, Tony Skinner, a Gonzaga guard who averaged only five points per game, hit an open three to tie the game at 74. On the next possession, Walton drove to the hoop and was able to draw a fifth foul on Turiaf with two minutes left in the game, sending him to the bench. In his place came Richard Fox, who averaged only 3.6 points per game on the season. 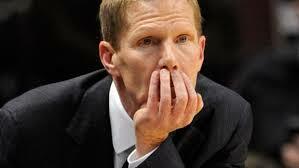 With 25 seconds left, Gonzaga had to foul, and Arizona gained a three point lead at 77-74 behind two made free-throws. Stepp missed a long range three, but it was tipped in by Fox in order to bring the Zags within one. 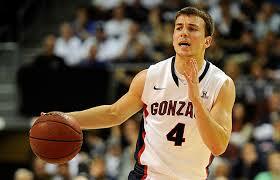 The Zags fouled Gardner with 15 seconds left. Gardner made one of two to give increase Zona’s lead to two. With no timeouts left, Stepp ran the court and fired another three that rimmed out. It fell into the hands of Skinner, who put it back as the clock expired to send the game to overtime. There would follow two tense overtimes, with Stepp and the unknowns Fox and Skinner stepping up to keep Gonzaga in the game. I will spare you the details, but Arizona went on to win the classic game by one point. If you want to watch some March Magic, the game can be seen here. Last season Gonzaga was considered a disappointment for many. Having entered the tournament as a number one seed and ranked number one in the nation for the first time in school history, they were stopped by the agressive play of the 9 seeded Wichita State Shockers in the round of 32. Wichita State went on to the Final Four. This year, Wichita State is the only remaining undefeated team, and is a number one seed in the Midwest bracket. This year, Gonzaga received an automatic bid to the tournament by winning the WCC conference championship, with an overall record of 26-6. The general consensus this year is that Gonzaga is a good match for Arizona, and a major obstacle for them to get to the Sweet Sixteen and beyond. ESPN commentator Bruce Pearl considers the round of 32 to be Arizona’s major obstacle to making it to the final four. Gonzaga is strong offensively. They are 5th in the nation in field goal percentage. They are 30th in the nation in rebounding, and the average more points per game than Arizona. Gonzaga’s leading scorer is Kevin Pangos, who averages 26 points per game, followed by Gary Bell Jr., with 17 points per game. Both are excellent outside shooters, and it is safe to say that Arizona will focus on defending Pangos. Sam Dower at 6’9″ is stong on both ends of the court, with 14 points and 9 rebounds per game. David Stockton, the son of hall of famer John Stockton, also plays for Gonzaga as a guard, and leads the team in assists. Arizona is considered by some to have the best defensive play in the nation. They are fourth in points allowed per game, and 18th in rebounding. Arizona also has the top RPI and BPI in the nation. Arizona’s current record is 31-4. They finished the regular season with the best record in the PAC-12, but lost in the final round of the PAC-12 tournament to UCLA. To get to the final, they crushed Colordo by 20 points, and Utah by 32 points. Many people were surprised by how sixteen seed Weber State held up against Arizona in the second round of the NCAA tournament. The Wildcats’ top scorer is 6’3″ guard Nick Johnson, with 18 points per game, followed by 6’9″ forward Aaron Gordon, with 16 points and 8 rebounds per game. Overall, they appear to be a well balanced team with excellent rebounding. Four players average double digit scoring, and four players average more than five rebounds per game. Arizona is coached by Sean Miller. Arizona will use its defense to attempt to stifle Gonzaga’s offense. If Gonzaga can find a way to get into a scoring rhythim either in the paint or from outside, they stand as good a chance as any of winning the game. A major theme in this game may be the battle of the boards, and foul trouble might become a factor. Rebounding, hitting freethrows, and outside shooting will all be important factors in the game.